That moment emotion rushes through you like a swift gust of desert wind. When you reach to brush the sand from your cheeks only to realize those are tears. The photographer and writer in me is constantly looking at angles. Angles for a shot. For that perfect sequence of images that will help to tell my story. And angles to a story that will help me find my words. I was completely unprepared for Angels Rest. 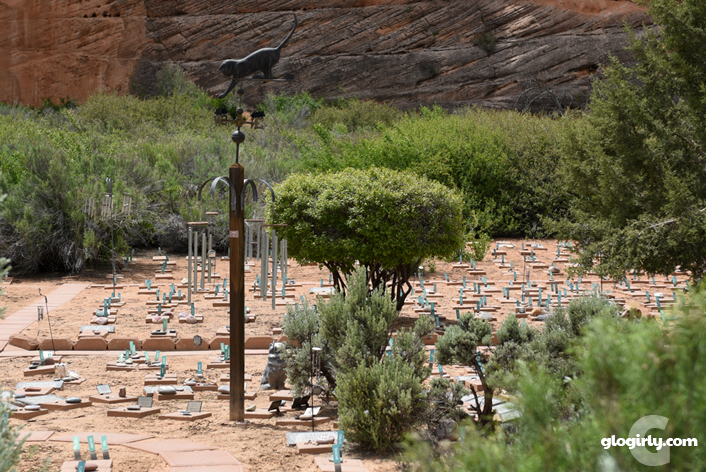 The final resting place for sanctuary animals and beloved companions of Best Friends members and staff, it's more than just a cemetery. It's a place of peace and reverence. It's evidence of the love and respect we hold for our pets and for all animals. Welcome to the third and final chapter of my Best Friends experience. Katie and Waffles have taken the week off and have turned the blog reins over to me (Glogirly) for the first time in the eight year history of our little cat blog. Don't worry, they're busy enjoying sun puddles and bird watching while plotting their next adventure. I hope you enjoy this series much as I've enjoyed sharing. And I hope Best Friends touches you as they've touched me. Our small group of nine set off on a hike through the gorgeous coral sands and red rocks of Angel Canyon, home to Best Friends Animal Sanctuary. Our guide Cyrus Mejia, one of the original founders of Best Friends, led the way through paths less traveled. 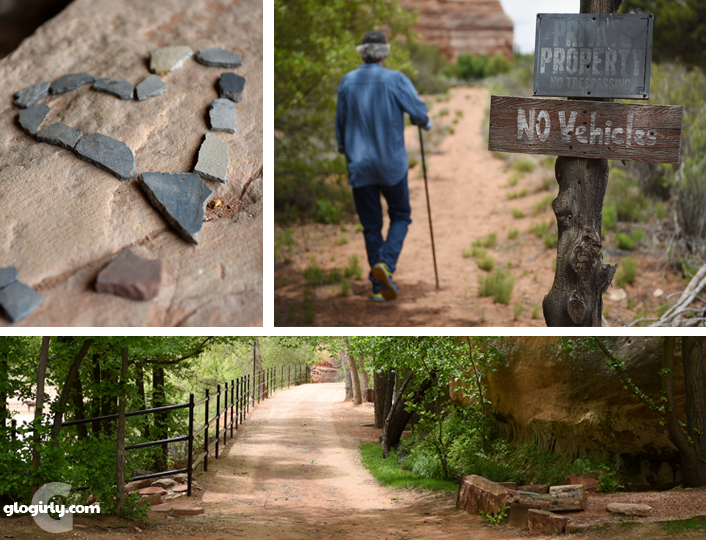 We hiked through ancient lands where signs of people living 1000s of years ago still remained. When the trail led to a fork, we paused and Cyrus told us of a conversation he once had with a rattlesnake. A gentleman's agreement of sorts. There was an easy way and a hard way to negotiate the trail. The snake preferred the easy way. After a few encounters, Cyrus proposed taking the tough route up a steep and rocky incline if the snake would agree to stick to the easy side. And so they came to a peaceful understanding. We never saw the snake and were very happy to know the snake kept his word. 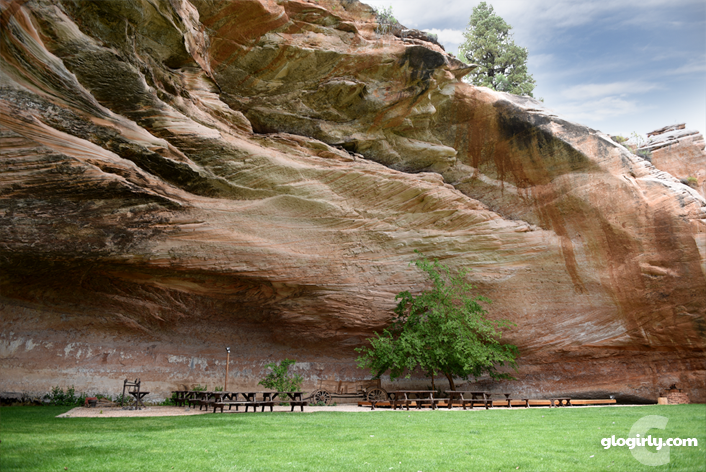 Just a short distance from the trail head sits an enormous red rock amphitheater with a lush grassy meadow at its base. It's where visitors and staff enjoy concerts and gatherings and it's where Jackson Galaxy was married in 2014. The acoustics will take your breath away. You can stand on one end of the space and hear someone's voice on the opposite end. The 3,700 acres of Best Friends Angel Canyon is filled with vistas and scenes just like this. As the afternoon drew to a close, we arrived at Angels Rest. Though the hand-forged iron gates (designed by Cyrus) welcome you from the main road, we'd entered through the back from the hiking trail. Perhaps that's why I never saw it coming. The grounds are simply gorgeous and took my breath away. Walking paths wind through the space and small markers are placed at each grave. Every single animal is celebrated and honored, both in name and in ceremony. 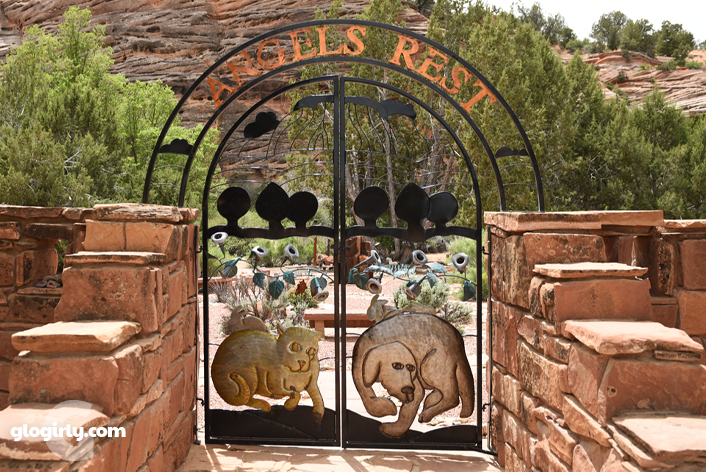 Each month, memorial services are held on the grounds of Angels Rest for those animals who have passed away. With so much to take in, I was completely focussed on photos. Everything I saw... I just knew everyone would want to see it. It can be windy in the canyon, but when we arrived it was eerily quiet. Then like someone tapping me on the shoulder, the breeze wafted through the air and the flutter of a thousand wind chimes began to ring. Soft at first, then a concert of notes as the powerful gusts took over. I thought about my mom and dad and how they taught me to love animals both through their actions and words. I remembered every animal from my childhood. Lady, Snoopy, Brandy and Big Red. I remembered the tiny kitten, abandoned in a grocery store parking lot, my mom and I found and rescued when I was 7 years old. I remembered Nicki, the cat who was with me and my dad the night that cancer took my mom from us. Our sunglasses may have shielded our eyes from one another, but I know for certain that my traveling companions were awash in the same emotions. Every grave, every ledge, every surface is adorned with small stones. But it wasn't always that way. Years ago a Jewish family laid their beloved cat, Tzipporah Countess of Calico, to rest. They placed memorial stones on her grave. It's considered a mitzvah (a good deed) to place them on grave sites as a way of honoring the deceased and fulfilling the obligation of kavod hamlet, respect for the dead. Unlike flowers, stones last for eternity. And like the memory of our loved ones, stones will never die. 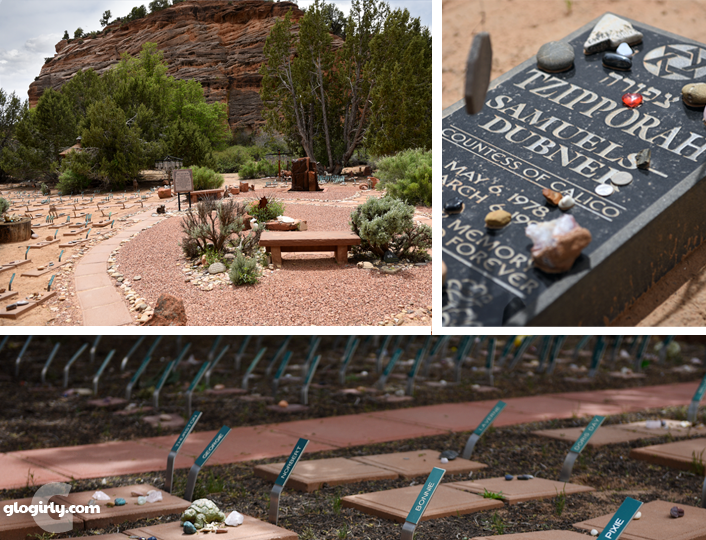 It was such a powerful and meaningful message, that people began placing stones on all of the graves. 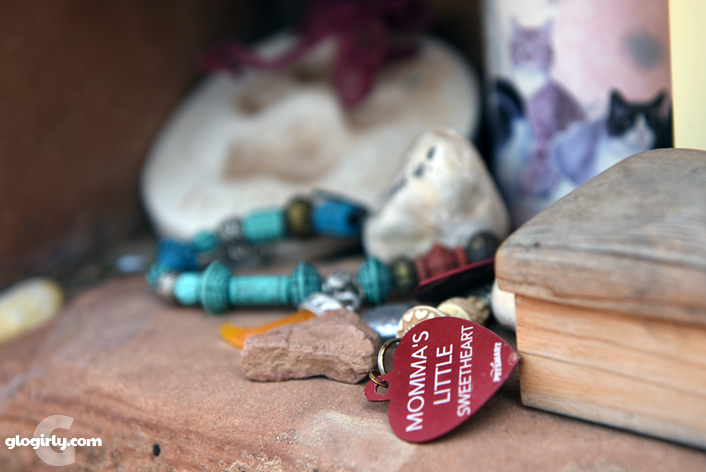 Visitors bring stones to remember those companions they have lost. Some are shiny and luminous as precious gems, some inscribed with messages of love and remembrance. My Sanctuary experience has left an indelible mark on my heart and my soul. This place, it's a celebration of the living and of those we've lost. Many rescue workers come to Best Friends each year to recharge and reflect. Rescue fatigue can be debilitating. Working in the trenches and witnessing the daily suffering of animals can take it's toll. 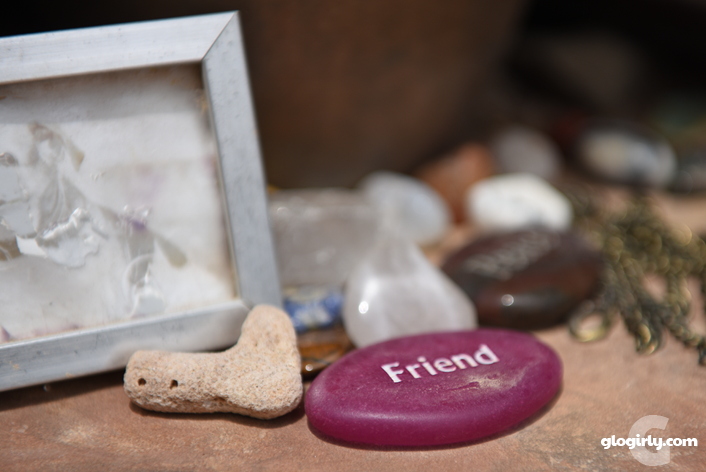 Best Friends is a place where like minded people can come together to give, to love and to heal. 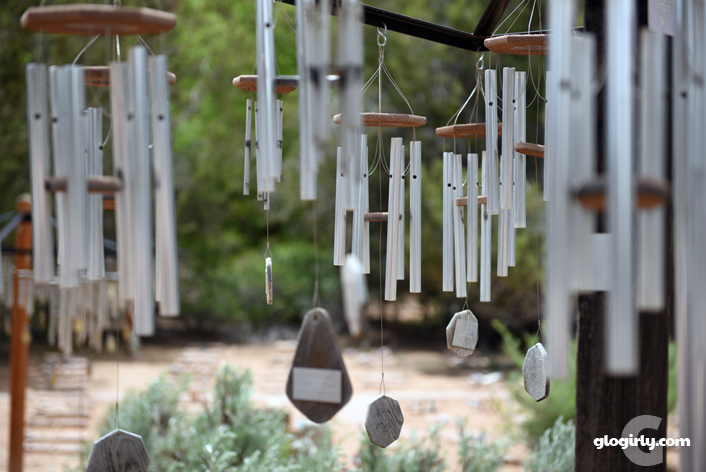 Each of those wind chimes are a memorial for someone's beloved pet. In addition placements, granite markers, dedication plaques and flagstones can all be arranged ordered. 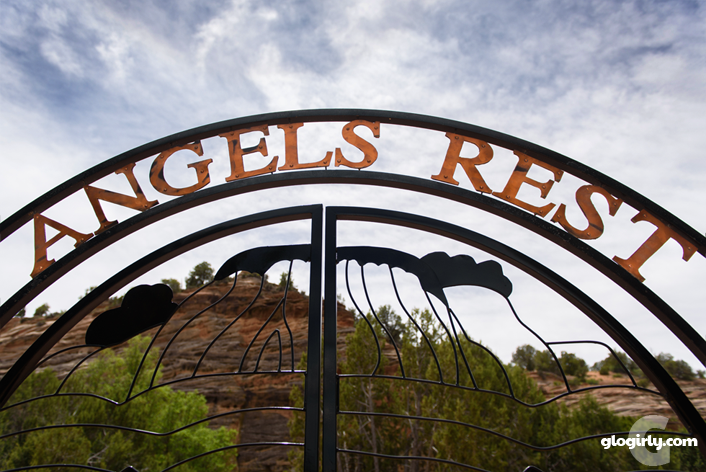 Visit Best Friends Angels Rest for more information. If you missed our first post earlier this week, there's plenty of time to catch up. WOW. Just WOW. Your pictures and words are so incredibly moving - I was sobbing by the time I finished reading, "I cried for the souls of the cats who never had their own sofa to curl up on or a human companion to sleep with at night. I cried for the dogs that never had their own yard to play in and the Champions rescued from unspeakable acts. I cried for the young ones who didn't make it and the elders who could wait no longer. I cried for all the animals and their caregivers." Every single one matters - no matter where they were born or how they live or how they die. Each one is LIFE. 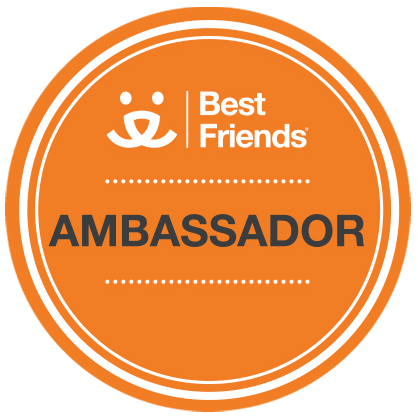 Thank you so much for sharing your experiences at Best Friends - you've done an amazing job in relating just how special the place is. I knew this one was going to make me cry. I'm speechless, too. Just. Wow. Angel's Rest and Angel's Crossing (the new one up on the cliff) are pretty amazing places. I went to a memorial ceremony the first time I went to visit. The entire time, it was quiet and peaceful and not a breeze. They got to the end and the wind picked up and every chime started to ring. And while it is sad, it is also amazingly restful and uplifting at the same time. I volunteered at Best Friends many years ago, best week of my life. Every evening I would go to Angel's Rest, it's a place that will always be in my heart and soul, a place every animal lover, if lucky enough, should experience. Speechless. That's so sweet that they remember the pets that passed. I agree - wow. Angel's Rest has such a powerful impact on people, and as incredible as your words and images are, I can only imagine how swept away you must have felt, being there in person. Thanks for sharing. Sounds like a wonderful place. 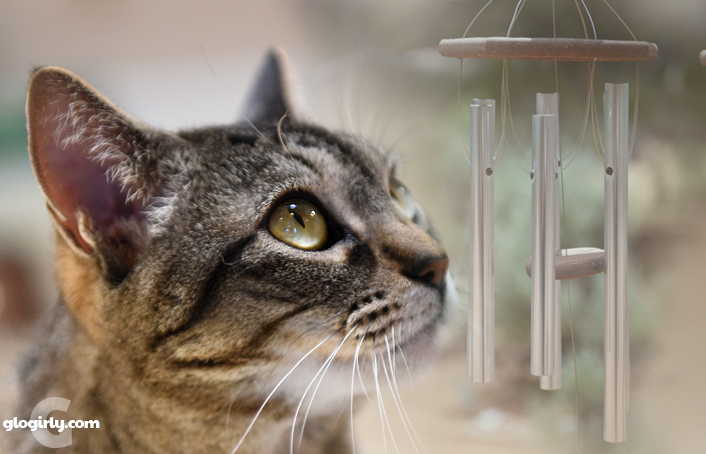 We's sorry Glogirly, this is purrobably a lovely posty but da wind chimes made mommy start cryin' and missin' sis Lexi too much to read further. Fanks fur sharin'. OMC we are leaky eyed too. This is such a beautiful post. We can almost hear the wind chimes....what a super way to honor those who have gone to the Bridge. Mom's been away so we'll have to go back and read your other posts too. WOW. How utterly moving. Thank you for sharing your experience with all of us. My eyes are leaking a river...if there is such a thing as Heaven on earth, this place is it. Tears in my eyes reading this. A heartfelt thank you. Ahh GG I've been loving this series and this one made me cry! You take amazing pictures and tell an amazing story. Love you so my friend! The head peep didn't dare read this one at work. Or until the rest of the house was in bed so she could cry without anyone noticing. Thank you so much for sharing this with all of us. I saw this post yesterday morning, but knew I couldn't read it and expect to get through the day of work ahead of me. I was right. This left me, like so many others have posted, in tears. What an amazing description of what must be the most peaceful place on earth as we know it. Best Friends is on my bucket list. When I go, I won't bother to try to put into words what I see or how I feel, for your words have to be the best description of the beauty and the feeling of this most sacred place. And so I too cry... May God Bless all these precious creatures... Thank you for sharing such a touching and beautiful tribute. My heart aches for them all... Purrs from Deb and the Zee/Zoey gang. Incredible and so very moving. Tears here, too. How wonderful that there is such a nice place for the residents to be remembered. Mum got all leaky eyed reading this, can understand that your heart was touched. What a wonderful place! So beautiful. Thanks so much for your kind words for my daughter about her loss of Kitty. He adopted her back yard 7 years ago, and then she discovered he was about 5 years old -- but very skinny and matted and just a mess. He had a wonderful home with her and her family. They really loved on him lots! I was crying too looking at the photos of Angels Rest... so beautiful. Thank you so much for sharing and looking forward to when I have some time to read through all the posts of your visit. -Purrz from Katie Kat. Thanks for this 3 part post about a wonderful place. It sets the standard for animal shelters. Nice to see the animals respected in all phases of their lives. Our best friend's only deserve the very best! It's good to know that there is a sacred sanctuary where they can rest peacefully just like what I've read from funny paper penguin, where animals are given special treatment dead or alive.